Last week, the company that (literally) kickstarted the new virtual reality industry announced a groundbreaking new controller that lets you reach out and touch things in virtual worlds. I just gave it a spin. It’s good. Damn good. So damn good it makes me want to hold off on buying a virtual reality headset. Wait, what? Before I get into that, let me explain what an Oculus Touch is, and why it’s so damn good. Oculus Touch is a pair of wireless controllers, one for each of your hands. Kind of like a Nintendo Wii Remote and its companion Nunchuk—except here, each controller is a mirror image of the other, and there’s no tether between them. They’re way the heck more accurate at detecting your movements, too. The Oculus Rift can tell exactly where they are in 3D space because they’re covered with little infrared LEDs that get picked up by the same infrared camera which tracks the Rift headset. Each controller has an analog stick and two buttons up top, a trigger under your index finger, and another under your middle finger to grip. And— a detail that got glossed over during their announcement—they’ve got sensors under each of those triggers to tell whether your fingers are actually touching them. What does that all mean? It means that when I picked up a pair of Oculus Touch controllers and stepped into a virtual world, I had hands. And not only did I have hands, but the most natural, intuitive pair of hands I’ve had in virtual reality. The demo I tried, a sandbox experience called The Toybox, doesn’t look like anything special. No out-of-the-world graphics or anything like that. It’s mostly just an open, empty space where you’ll find a vast table covered with toys—remote control cars, blasters, lots of toy blocks, boomerangs and slingshots, lawn gnomes (! ), a tetherball, stuff like that. Oh, but it’s a social experience—Oculus founder Palmer Luckey was right there with me, his ghostly visage represented by a transparent blue Oculus Rift and his own pair of hands. He started to explain the controls. Why, I have no idea—because I was already reaching out and grabbing things with my hands. My hands. Not a magic wand or a tractor beam or a portal gun. When I closed my real-world hand to grip things, I gripped them in VR. I didn’t need to use an iota of conscious thought, no “hey I wonder which button I should press?” to do it. It was freaking awesome. And as soon as I took my thumb off the analog stick, or my index finger off the trigger, my virtual one jutted out in mid-air to point or form a thumbs up. I bounced a ping-pong ball off a paddle. I accurately blasted away targets with a slingshot—just reaching out and grabbing the elastic band. I headbutted that tetherball. I threw objects through the air. Reached out and grabbed toy guns off the table as if it was nothing, immediately started blasting away, then dropped them just as easily. I drove a toy R/C tank around that could blast through walls. Lit sparklers and roman candles with a pocket lighter, then waved them around to send fiery trails and rockets soaring through the sky. And through all of it, Palmer was there playing with me, throwing boomerangs through the air for me to blast or—get this—handing me objects that I could grab right out of his hands. If you’re not impressed, know that up till now, most motion controllers have relied on a certain amount of... let’s call it stickiness. Press a button to grab an object, and then your controller usually controls the object—not your hand. Even handing an item from one hand to another has been difficult, to say nothing of passing it to another person. Here, it was effortless. It’s just so very, very clear to me now how important motion controllers are going to be for virtual reality. How amazing it is to put your hands into an experience. How much more real it feels. 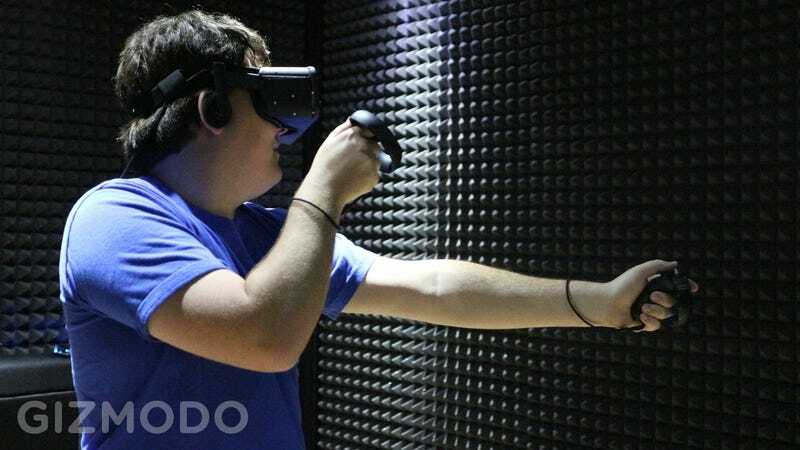 But the final Oculus Rift won’t ship with these amazing motion controllers. It’ll only come with an Xbox One gamepad to start. And I’m not saying you should wait until it does. You could buy an HTC Vive, which is shipping later this year, or Sony’s Project Morpheus, which will arrive in the first half of next year. Both of those are freaking awesome experiences too. But it’s not clear yet if any of the three different sets of motion controllers—Valve, Sony, Oculus—will be even remotely compatible with one another. In fact, Palmer Luckey and fellow Oculus exec Nate Mitchell suggest they won’t: as far as Oculus is concerned, it’s all about providing the best motion control experience—even at the expense of interoperability. Will game developers will be willing to embrace multiple different VR controllers—on top of the challenge of embracing VR, period—and put in the effort to make sure their games will work across all of them. Unclear. And if not, it could mean that some VR systems have some games, and other VR systems have other games. Like a game console, you shouldn’t just buy whichever VR headset looks best and expect all the latest, greatest VR games to arrive there. We’ll know more about some of that content soon. Oculus is promising plenty more announcements between now and launch, and we haven’t even seen a final Sony Morphus or HTC Vive yet. Plus, I’ll tell you about the games I tried on the final Oculus Rift and Sony’s Morpheus later this week—to give you some idea of what to look forward to!